Club Penguin Cheats by Mimo777 Club Penguin Cheats by Mimo777: Exclusive Field Op Message Glitch...Again! 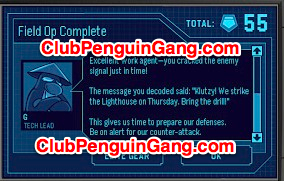 Do you remember last June when several penguins got the following Club Penguin message after completing Field Op 49? At that time, we suspected, during Field Op 55, Herbert and Klutzy would attack the Lighthouse like they did the Everyday Phoning Facility. But, Field Op 55 came and went without any incident. It even still says Field Op 55! So Weird! Do you think this could still happen? If so, when? Herbert did have something to do with the Beach sinking during the Underwater Expedition. Hmmm, do you think he is just floating somewhere out by the Beach? I'd love to hear all your theories, k? Mimo....In the town...I'm not sure if I'm going crazy but there might be a distinct lack of trees.What the heck? My theory is that somehow Herbert is hacking the message system to make us THINK that G is telling us this stuff. Why would he do that, you ask? To sow fear and paranoia. Nice Theory Anoymous in the 3rd Comment! But I believe when Klutzy escaped during the Operation:Hibernating Herbert,you could see during christmas kluty with him. He likely woke up,went to the recycling center,tampered with the Anvil Order,and helped Herbert Escape! What I think is that Owenx98 might have got somewhere near Herbert's spy phone (which he got from Rookie long back). That's why the message got repeated. That's my theory. On the map on the Migrator,notice in the very top near Shipwreck item a missing part that seems burned or ripped out purposely? Perhaps Rockhopper Island is being hidden! A sign we could be going to R.H. Island soon on the USS Migrator! Yeah, I noticed that too! Hopefully Mimo gives you credit! Hi Mimo! I've found another glitch. When you go to your igloo, all your puffles have a "hungry sign" above them. So this is what i think. Remember when Klutzy was missing from the herbert cam (sorry my question mark button dont work) Well Klutzy probably messed with the anvil order and made the island sink. so herberts cage slid across, Broke the wall and herbert was free. That is my theory. IF YOU LOOK IN THE TELESCOPE IN THE BEACON YOU WILL SEE SOMETHING RED SPARKLING!!!!!!!!! i wont be on much i am going to camp for 3 days hope they update the next party or somethin bout herbert! I was just on club penguin and I was in the Town. When I got there the sky was normal but then it turned orange!!! After a minute the sky cleared up but there were fire balls flying threw the air! It was so weird!I thought you might like to know this. 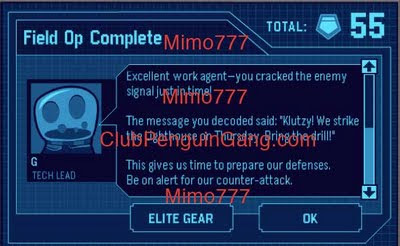 CP Just uses this text to test field ops. The lighthouse is safe. It's not real. Sorry,but mimo already noticed this. Yeah! That's a great theory! I hope that's right, I love to go to Rockhopper Island. Mimo Knows About That Long Time Ago...It Was At The Ninja Party And You Didnt Know All The Time ? What Are You A Newbie ? Rhealady123, I think that is Shipreck Islands becon. Mimo, how old are you? How old are most of you other people? you click on the beacon on shipwreck island. When are there going to be more St.Patricks day parades on club penguin???? Do Rockhopper's quest, build the beacon on shipwreak island by clicking on the materials needed that are in a pile to get the pin. Hey! It's not nice to call someone a newbie. It's just that, he maybe missed the party and didn't know about that. Also, I saw that same thing with the water ninjas.